While one of the most common pets in the United States, cats are also one of the most difficult pets to take care of when it comes to medical issues and illnesses. A pet that is known for being naturally lethargic and somewhat aloof, can be difficult to diagnose, especially if it is new to the family home. The best way for New Bedford pet owners to stay on top of any potential problems is to bring their cat in for an annual check-up at the local Southeastern Massachusetts veterinarian. While there are uncommon illnesses that can befall your pet and affect humans as well, such as cat scratch fever or Feline Immunodeficiency Virus (FIV), there are also regular things that you can do to help keep your pet from developing problems later in life. Feline dental care should be provided in-office and at-home to help keep your pet’s teeth strong and mouth healthy. Cats have earned a reputation for being strong and somewhat elusive in telling their owners when things are wrong. They can hide signs of being sick in a number of ways, so it is up to concerned humans to stay alert to potential problems before the illness becomes so severe that nothing can be done. The best tool to keeping your pet healthy, outside of regular check-ups with your Southeastern Massachusetts veterinarian, is to spend time with your cat daily, interacting with him or her, and paying attention to their regular habits and behaviors. Sign #1 – Change in Activity – One of the first things that you will notice about a cat that is not healthy is a change in activity. A cat that once slept all day who is now up and awake, following you around or exhibiting other behaviors, is a cat that is stressed or simply not himself or herself. On the other hand, a cat that is now sleeping more or sleeping in a different place may also be in need of attention. Sign #2 – Change in Appetite/Eating – It is important to pay attention to your cat’s eating habits, noticing a decline in appetite or an increase in appetite. Cats that are constantly begging for and eating food can be exhibiting signs of serious diseases, such as diabetes or hyperthyroidism. A sudden decrease in appetite for food or even water, can also be a sign of other types of health conditions. If your cat does not eat or drink water for 24 hours, bring her to your Southeastern Massachusetts veterinarian right away. Sign #3 – Change in Behavior – Some cats are more active than others, so it pays to know as much as you can about your cat. A sudden change in activity, such as running around like a kitten at a much older age or just one day becoming much more lethargic, can be signs of thyroid problems, arthritis, body aches and pains, as well as other serious issues. New Bedford pet owners should contact the local vet or bring their cat in for an exam. Sign #4 – Change in Bathroom Habits – Another way to check the health of your cat is to monitor litter box activity. The frequency of use, the color and smell – even the volume of urine or solid waste – these can all be indicative of health issues. Bathroom issues can indicate urinary tract infections, blockages or disease. Sign #5 – Change in Sleeping Patterns – Cats sleep a lot more than people do, but if you notice that your cat is sleeping a lot more than usual or sleeps more during the day and is up all night, there could be an underlying cause for this new behavior. Speak with your Southeastern Massachusetts veterinarian or bring your pet in for a check-up. Sign #6 – Change in Human Interactions – A cat that is suddenly “clingy” or “frightened” around people that it sees every day could be a subtle sign of an illness or other health issues. Some cats are more clingy than others, but if the behavior is new and there is no obvious cause, you might want to speak with your vet. Sign #7 – Change in Grooming Habits – Unfortunately, this can be a dangerous sign that can require immediate attention. Cats like to groom themselves, quite often too much, but a cat that smells or stops grooming could be suffering from health issues. Report this to your vet right away, along with any other symptoms even if they do not seem related. Sign #8 – Change in Appearance – This goes along with grooming. A cat that is no longer fluffy, but has a wet or oily appearance to its fur, could be suffering from diabetic or kidney disease related problems. Sign #9 – Change in Voice/Breathing – Some cats are more vocal than others, but if your cat starts making strange sounds, “talks” to you more than usual or stops making noises all together, if could be indicative of other issues. Breathing problems, high blood pressure, hyperthyroidism and anxiety, are just a few of the issues that can present first in this way. Sign #10 – Change in Mobility – Cats that stop jumping up on furniture or cry when they want to jump down from furniture, could be suffering from arthritis or other related conditions. Make sure to be aware of any changes in mobility in your cat. Sign #11 – Change in Smell/Odor – While some of this could be related to grooming issues, other smells and odors could be indications of dental issues that could be solved through professional and at-home feline dental care. Others, could be signs of disease or other health problems that may require more care. Sign #12 – Pet Parent Instincts – Do not discount your own instincts. 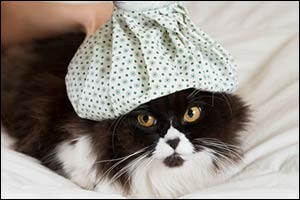 Even if your cat is not displaying any of the classic signs of illness, bring them into the vet for a check-up. You know your cat better than anyone else, so if you feel like something is off or just not right, contact your Southeastern Massachusetts veterinarian right away. If you live in the South Coast area and have any questions about your cat’s health, contact Anchor Animal Hospital to set up an appointment or to discuss options with regard to emergency veterinary service. We have been providing top quality services to New Bedford pet owners and pets throughout the South Coast region for over 40 years. Give us a call today at 508-996-3731.